Mold spores exist everywhere in the outdoor environment and can easily get indoors through open doors and windows or attached to clothes, shoes, bags, etc. Once they enter the home, the spores stay dormant, waiting for the right conditions (organic food source and moisture) to start developing. Leather couches and fabric covered chairs provide excellent food for mold development. Upholstered furniture, such as leather couches and fabric-covered chairs, provides an excellent food source for mold. As soon as there is enough moisture in the home environment (whether from condensation, flooding, or some other cause), mold will begin to grow on the porous upholstery materials. Mildew stains will appear on the upholstered surface and the furniture will start to smell musty and stale. 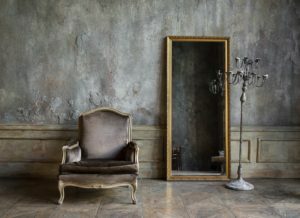 Unless the problem is promptly dealt with, the harmful fungi will cause the leather or fabric to deteriorate and will completely destroy the furniture. What’s more, the mold spores will start spreading to other household materials, causing considerable structural damage and posing serious health risks to the occupants of the home. To avoid such troubles and save your furniture, you need to take quick and efficient measures at the first signs of mold growth on your upholstered pieces. If your leather sofa or fabric chair is dusted with green (or white, or black, or gray) or smells musty, you have no time to waste – the piece must be cleaned and dried out without delay, so that the mold spores are removed before they can cause further damage. Mold is caused by moisture, so it’s preferable to clean the furniture in a dry environment. Taking your affected piece out on a non-humid day will give it the opportunity to dry out, which will make mold easier to remove. Besides, the ultraviolet rays of the sun have a natural sterilizing effect and kill mold, so you may want to let your furniture sit in the sun for a few hours before you start cleaning it. Keep in mind though that direct sunlight may cause the upholstery colors to fade and decide if it’s worth the risk. If it’s impossible to take the furniture piece outdoors (or the climatic conditions are not appropriate), ensure that the room you’ll be working in is properly ventilated (keep the windows open, use fans, etc.) and the indoor humidity is low (run a dehumidifier, if necessary). Keep the door of the room tightly closed to keep the mold spores from traveling around your home and prevent cross contamination. Also, be sure to put newspaper underneath the furniture to “catch” the mold spores that you’ll be removing. 2) Inspect the furniture piece – Even if the mildew appears to have affected only a certain section of the upholstered piece, check every furniture surface (beneath slip covers, under seat cushions and backrests, etc.) to find out the full extent of the damage. You don’t want to miss a mold stain when cleaning the furniture as the spores can easily spread to the entire piece again. Wear a face mask to avoid inhaling the mold spores. Once you’re fully ready, you can get down to work. Clean the furniture with rubbing alcohol – For best results, prepare a cleaning solution of equal parts water and rubbing alcohol. Dip a sponge in the mixture (or dampen a clean cloth with it) and wipe the affected area – the rubbing alcohol kills mold on contact. Rinse with clean water and leave the furniture to dry. Be careful not to soak the leather too much and make sure the furniture is fully dry before using it again (let the furniture sit outdoors (or in a well-ventilated, dry room with plenty of daylight) for several hours after cleaning it). Good to remember: Always test the cleaning solution you intend to use on your mold-affected upholstered furniture on an inconspicuous area first to see if it won’t damage the fine leather. Let the upholstery dry well – Leave the upholstered furniture outdoors (or in a well-ventilated, low-humidity room) for several hours to dry completely and check for remaining mold stains. If there are any, spot treat the affected areas with rubbing alcohol, as explained above. Good to remember: Avoid using bleach as this can affect the color of the upholstery. Also, be sure to test the cleaning solution on a hidden area first to ensure it does not discolor the fabric. Steam clean the fabric upholstery – The heat of the steam will kill the mold and the steaming process will leave the upholstery looking good and smelling fresh. If the mold or mildew is still on the surface, you can efficiently clean the upholstery yourself, using the above methods. If the mold spores have penetrated deep into the fibers of the upholstery, however, you need to have the furniture professionally cleaned. 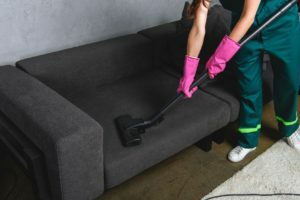 The experts have industrial strength cleaners and specialized equipment, so they can do the job right and successfully remove both the mold and the musty smell from your upholstery. Whether you decide on DIY cleaning or professional cleaning, make sure the mold is removed in a timely and effective matter – if the problem is left untreated for a long time, the mold will cause considerable damage to your furniture. In such a case, only professional furniture restoration will be able to bring your upholstered piece back to life. So, if you find your furniture covered in mold stains (after you retrieve it from storage or when you bring it back in your living room after several months in the basement, for example), call an experienced furniture repair specialist without delay – your cherished upholstered piece may still be saved.